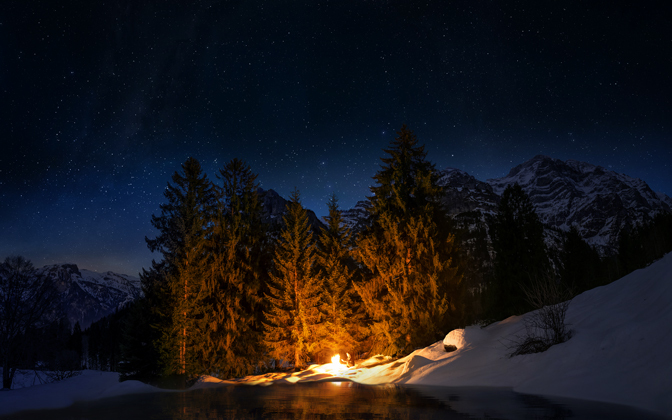 No matter how dark the night, the bigger the campfire, the more darkness is revealed! Taken with a Nikon D850 and a Sigma 14mm @ f/1.8 (ISO 400) & 15 seconds exposure. Three individual shots were stitched together in Lightroom CC Classic and then processed in Photoshop CC. Color correction with NIK Color Efex. Finding right spot & preparation took 6h plus editing another 3h. Enjoy and let me know whether you'd like to know more. Adobe Photoshop and Adobe Lightroom CC. Photo Settings: 14mm, f/1, 15 seconds, ISO 400. Send a Private Message to the Artist of "The Wanderer At The Campfire"